Manuel Pardo listens as his sentence is read in 1988. Updated at 8:15 p.m. 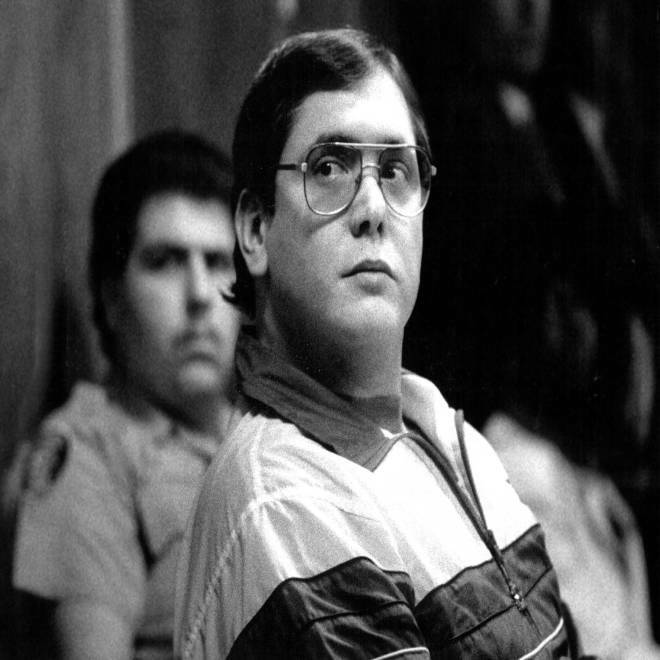 ET : STARKE, Fla. -- A former police officer who murdered nine people during a 1986 crime spree was executed Tuesday after his attorneys' last-minute appeals were rejected. Manuel Pardo, 56, was pronounced dead at Florida State Prison at 7:47 p.m., about 16 minutes after the lethal injection process began. His attorneys had tried to block the execution by arguing that he was mentally ill, but federal courts declined to intercede. Reporters could not hear his final statement because of an apparent malfunction in the death chamber's sound system. A white sheet had been pulled up to his chin and IV lines ran into his left arm. He blinked several times, his eyes moved back and forth and he took several deep breaths. Over the next several minutes the color drained from his face before he was pronounced dead. Pardo spent Tuesday afternoon with eight family and friends and ordered a Cuban-style meal of roasted pork chunks, white rice and red beans, fried plantains with tomato and avocado, topped with olive oil, the Miami Herald reported. For dessert, he had pumpkin pie and Cuban coffee. Officials said most of Pardo's victims were involved with drugs. Pardo contended that he was doing the world a favor by killing them over three-month period in early 1986. "I am a soldier, I accomplished my mission and I humbly ask you to give me the glory of ending my life and not send me to spend the rest of my days in state prison," Pardo told jurors at his 1988 trial. Ann Howard, a spokeswoman for Florida's Department of Corrections, said that Pardo visited with eight people Tuesday. He also met with the prison chaplain and a Roman Catholic bishop. Pardo ate a last meal of rice, red beans, roasted pork, plantains, avocado, tomatoes and olive oil. For dessert, he ate pumpkin pie and drank egg nog and Cuban Coffee. Under Department of Corrections rules, the meal's ingredients have to cost $40 or less, be available locally and made in the prison kitchen. Pardo was dubbed the "Death Row Romeo" after he corresponded with dozens of women and persuaded many to send him money. Pardo, a former Boy Scout and Navy veteran, began his law enforcement career in the 1970s with the Florida Highway Patrol, graduating at the top of his class at the academy. But he was fired from that agency in 1979 for falsifying traffic tickets. He was soon hired by the police department in Sweetwater, a small city in Miami-Dade County. In 1981, Pardo was one of four Sweetwater officers charged with brutality, but the cases were dismissed. He was fired four years later after he flew to the Bahamas to testify at the trial of a Sweetwater colleague who was accused of drug smuggling. Pardo lied, telling the court they were international undercover agents. Then over a 92-day period in early 1986, Pardo committed a series of robberies, killing six men and three women. He took photos of the victims and recounted some details in his diary, which was found along with newspaper clippings about the murders. Pardo was linked to the killings after using credit cards stolen from the victims. Regino Musa, the brother of one of Pardo's victims, said it's difficult to grasp that the execution will finally happen. He and his elderly mother planned to attend. "It's about time. It's been so long, you just want to get it over with," said Musa, whose sister, Sara Musa, was killed by Pardo. "I still have nightmares and I don't have words to describe it. I can't believe that it's happening."